The Radisson Blu Resort Fiji Denarau Island offers luxury waterfront accommodation on beautiful Denarau Island, just 20 minutes from the Fiji International Airport at Nadi, families and couples alike will love the Fijian welcome and stunning resort amenities including kids club, day spa, adults only pool and a myriad of dining options. This resort offers an excellent range of modern and stylish rooms from large hotel style accommodation to one and two bedroom suites. Located across three floor levels and offering a range of outlooks from tropical gardens to lagoon or pool views, the guest rooms and suites at Radisson Blu Resort Fiji Denarau Island feature a private balcony or patio, air conditioning, free WiFi, in room sound system and satellite TV. The 1 and 2 Bedroom Suites are ideal for families, each being self-contained with full kitchen and laundry facilities. 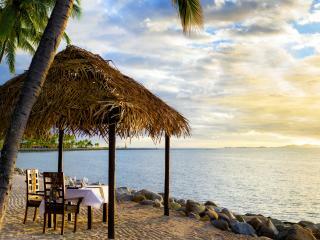 The Radisson Blu Resort Fiji Denarau Island offers an incredible array of onsite activities that will keep you busy including water sports, day spa and a variety of restaurants and bars from casual to formal dining. Choose from four lagoon style swimming pools including adult only pool areas and a water slide for the kids in the children's pool. This beautiful family friendly resort welcomes children and also boasts a Blu Banana Kids Club, along with a good quality babysitting service. With so much on offer and a variety of activities and accommodation styles, the Radisson Blu Resort Fiji Denarau Island is the ideal place to base yourself on your next Fiji holiday whether it be a family holiday, a couples romantic getaway, or fun times with friends. The Radisson Blu Resort Fiji Denarau Island has 134 guest rooms featuring island inspired interiors with distinctive Fijian features and a large private balcony offering amazing views over the golf course, tropical gardens or lagoon swimming pool. Standard Garden View King: Located on the 2nd or 3rd floor and offers a balcony with views of the resort gardens. Size is 41m². Bedding is 1 King Bed + 1 Trundle Sofa Bed or 2 Single Beds + 1 Trundle Sofa Bed. Maximum room capacity is 2 Adults OR 2 Adults & 1 Child. 1 infant can be accommodated in a cot in addition to the maximum occupancy. Superior Lagoon View King: Located on the 2nd or 3rd floor and offers a balcony with views of the lagoon and pool area. Size is 41m². Bedding is 1 King Bed + 1 Trundle Sofa Bed or 2 Single Beds + 1 Trundle Sofa Bed. Maximum room capacity is 2 Adults OR 2 Adults & 1 Child. 1 infant can be accommodated in a cot in addition to the maximum occupancy. Deluxe Courtyard Twin: Ideal for families and located on the ground floor with a patio. Size is 41m². Bedding is 2 Double Beds. Maximum room capacity is 3 Adults OR 2 Adults + 2 Children. Radisson Blu Resort Fiji Denarau Island boasts 135 suites that offer fully self contained accommodation that includes full kitchen and laundry facilities. Enjoy an extended stay with family or friends in one of the 1 or 2 bedroom suites at this modern and stylish Fiji accommodation. 1 Bedroom Courtyard Suite: Offers a fully equipped kitchen and laundry with a separate living area. Located on the ground floor and offers a patio which is surrounded by the resort gardens. Size is 78m². Bedding is 1 King Bed or 2 Single Beds + 1 Large Single Sofa Bed (which can accommodate 1 adult or 2 children). Maximum room capacity is 4 Adults OR 2 Adults + 3 Children OR 3 Adults + 1 Child. 1 Bedroom Garden View Suite: Offers a fully equipped kitchen and laundry with a separate living area. Located on the 2nd or 3rd floor and offers a balcony with views of the resort gardens. Size is 78m². Bedding is 1 King Bed or 2 Single Beds + Large Single Sofa Bed (which can accommodate 1 adult or 2 children). Maximum room capacity is 4 Adults OR 2 Adults + 3 Children OR 3 Adults + 1 Child. 1 Bedroom Lagoon View Suite: Offers a fully equipped kitchen and laundry with a separate living area. Located on the 2nd or 3rd floor and offers a balcony with views of the lagoon and pool area. Size is 78m². Bedding is 1 King Bed or 2 Single Beds + Large Single Sofa Bed (which can accommodate 1 adult or 2 children). Maximum room capacity is 4 Adults OR 2 Adults + 3 Children OR 3 Adults + 1 Child. 2 Bedroom Garden View Suite: Combines both a Guest Room and 1 Bedroom Suite. By securing the outer foyer doors at the entrance to each Room & Suite combination, this allows guests private access between the two rooms and whilst still enabling each to have their own privacy should you wish. Features a fully equipped kitchen and laundry with a separate living area. Located on the 2nd or 3rd floor and offers a balcony with views of the resort gardens. Size is 119m². Bedding is 2 King Bed or 4 Single Beds + 2 Large Single Sofa Beds. Maximum room capacity is 6 Adults OR 4 Adults & 3 Children. 2 Bedroom Lagoon View Suite: Combines both a Guest Room and 1 Bedroom Suite. By securing the outer foyer doors at the entrance to each Room & Suite combination, this allows guests private access between the two rooms and whilst still enabling each to have their own privacy should you wish. Features a fully equipped kitchen and laundry with a separate living area. Located on the 2nd or 3rd floor and offers a balcony with views of the lagoon and pool area. Size is 119m². Bedding is 2 King Bed or 4 Single Beds + 2 Large Single Sofa Beds. Maximum room capacity is 6 Adults OR 4 Adults & 3 Children. 2 Bedroom Courtyard Suite: Combines both a Deluxe Courtyard Twin Guest Room and 1 Bedroom Suite. By securing the outer foyer doors at the entrance to each Room & Suite combination, this allows guests private access between the two rooms and whilst still enabling each to have their own privacy should you wish. Features a fully equipped kitchen and laundry with a separate living area. Located on the ground floor and offers a patio which is surrounded by the resort gardens. Size is 119m². Bedding is 1 King Bed or 2 Single Beds + 2 Double Beds + 1 Large Single Sofa Bed. Maximum room capacity is 7 Adults OR 4 Adults & 4 Children. Blu Bar & Grill: Located right on the beach with fantastic ocean views and all day dining options. There is live entertainment each evening with a bar and grill à la carte menu available. Open daily. Chantara Thai Restaurant: Located on the lobby level overlooking the lagoon, Chantara Restaurant specialises in Thai Cuisine and is open daily. Neptunes: Includes gourmet and gluten-free pizzas, fish and chips and other easy choices for both lunch and dinner. Perfect for spending a quiet evening with family or friends, or just taking in the beautiful sunset. Basilico: Enjoy authentic Italian cuisine at this amazing new dining venue. Signature Tables: A couples-only romantic dining experience, overlooking the water. Enjoy a private candlelit dinner under the stars. Lomani Wai: An 'In the Water' dining experience. Fiji's first ever dinner in the water! A 3 course dining experience set completely 'in the water' of one of Radisson Resort Fiji Denarau Island's unique swimming pools. Reservations and advance booking highly recommended as places are limited. Harmony Retreat Day Spa: Float along the boardwalks lined with cascading waterfalls to the Harmony Retreat Day Spa. Set on a private island in the resort, this stunning oasis combines modern design with traditional Fijian themes that transport you to another time and place. Experience the tranquillity and peace of body treatments, massages and beauty therapies as well as traditional services including facials, waxing and spa manicures and pedicures. The Denarau Golf and Racquet Club is close to the Radisson Blu Resort Fiji Denarau Island and open to all golfing enthusiasts. The swaying coconut palms and gorgeous views of the South Pacific are a unique backdrop for your game on this 18-hole course featuring one of a kind tidal waterway challenges on holes 15 and 18, making this a 'thinking' course. Golf facilities include a driving range, two practice putting greens, a golf and tennis pro shop, Belo Vula restaurant, bar, adult and junior clinics and private lessons. Golf Course operating hours are 6.30am - 3.30pm. The Racquet Club is open 7am - 9pm daily and features six courts with four of these being floodlit for night games. Blu Banana Kids Club: The fully supervised kids club is close to the toddler's shaded pool on the scenic waterfront. Daily activities are designed for children aged 4-12 years and include treasure hunts, kids Olympics, sandcastles, coconut tunnel ball, basket weaving, frog and crab races, participation in the evening ceremonial lighting of the torches and more. There is a charge for the kids club payable direct to the resort (charges vary depending on the time of day spent at the Kids Club). Individual Session - approximately F$15 per child per session*, no meals are included. Themed Night Packages - approximately F$40 per child*, includes dinner. Babysitting: For ages 6 months to 12 years is also available in a variety of packages and pricing, payable direct. *All prices are payable direct to the resort and are subject to change at any time without notice. 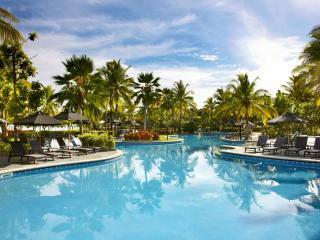 Radisson Blu Resort Fiji Denarau Island offers a wedding package. A minimum 3 night stay is required. Price is available on request, please contact us for a quote. Children: 0-12 years are free of charge in existing bedding. Cots can be requested for infants aged 0-3 years complimentary. Ratings are averaged based on 290 reviews. Fantastic resort, beautiful people, exceptional service... just had a great holiday. We absolutely loved everything about this resort. The staff, facilities, pool, food. All so amazing. 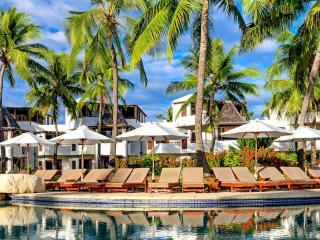 The pool caters for all ages of children, close to airport, port denauru and local township. Loved everything. Fantastic and full of fun. Great value and very enjoyable stay.